Blue & yellow matched perfectly here. I love the old bucket they're in! What a lovely way to decorate those steps. A very enjoyable photograph, thank you. Flower in these container are always nice to see. Please add that link and return to link in again. 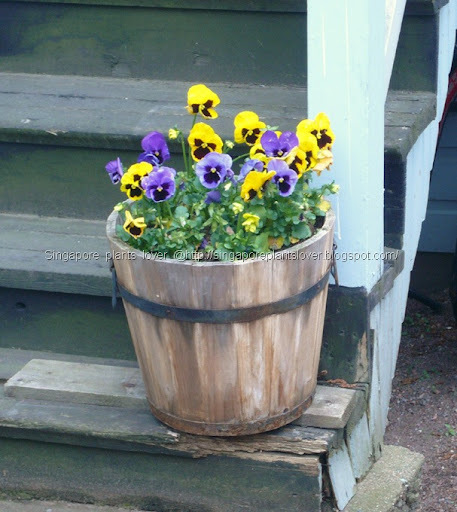 We are done with all our pansies here..These flowers are so summery looking! Do they grow in Singapore? Don't remember seeing them when I was there. My fav haunt in Singapore was going further Jalan Bahar, past the cemeteries, there is a garden centre, and an organic farm. I spent so much time at the organic farm that the boss lady asked if i wanted to volunteer there.